Globally acclaimed EDM (electronic dance music) DJ/producer Richard Durand and Black Hole Recordings are giving music fans a chance to have their very own track included on the North American installment of the Richard Durand Vs The World (Black Hole) album. The crowdsourced competition is open to the public and launches March 26th, 2012. The submissions deadline for North America is April 23rd, 2012, and the North American E.P. will be released May 21st, 2012. Contestants must use stems provided by Richard Durand. This is a once-in-a-lifetime opportunity for budding singers, songwriters and/or producers. Composers of the winning track will receive a writing share plus artist’s royalties. In a bold move, globally acclaimed EDM (electronic dance music) DJ/producer Richard Durand and Black Hole Recordings are giving music fans a chance to have their very own track included on the North American installment of the earth-encompassing artist album, Richard Durand Vs The World (Black Hole)! With a total of five E.P.s – each E.P. representing one continent or region of the globe – the Richard Durand Vs North America (Black Hole) E.P. will feature three tracks: one track that is 100% composed by Richard Durand; a second track that is a collaboration between Richard Durand and a noteworthy North American artist; and the third track consisting of the “winning” submission as voted on by fans and the public. The crowdsourced competition is open to the general public and launches on March 26th, 2012. The submissions deadline for North America is April 23rd, 2012. 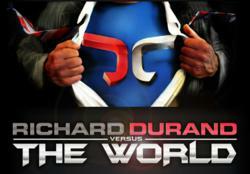 The Richard Durand Vs North America E.P. will be officially released and available for retail purchase on May 21st, 2012. Contestants must use stems provided by Richard Durand, but beyond that, there’s no limit to the possibilities of one’s imagination. This is a once-in-a-lifetime opportunity for budding singers, songwriters and/or producers! Stems for the Richard Durand Vs North America E.P. competition can be downloaded at Richard Durand’s website: http://www.richarddurand.com. Simply download the app and the base track. Contestants can go anywhere they wish from there. Contestants are encouraged to apply melodies, effects, basslines, percussion, vocals…there are literally no creative constraints. Composers of the winning track will receive a writing share plus artist’s royalties. Once the submissions deadline has passed, Richard Durand will select his favorite candidate tracks and post them for public listening on his Soundcloud page. Fans, fellow producers and music-lovers of all shapes and sizes will then be invited to post their comments on and vote for their favorites. Richard Durand wants to know what the fans think! After all, the art of the skilled DJ is to maintain a give-and-take with his/her audience. After considering all comments and votes, Durand will choose one lucky winner – which can be an individual producer, a singer, or a production team consisting of more than one person, for example – and the winning track will be included on the official Richard Durand Vs North America E.P. released May 21st. Region: Asia, Australia & New Zealand. Competition Started: November 14, 2011. Submissions Ended: December 12, 2011. E.P. Release Date: January 23, 2012. Competition Started: January 23, 2012. Submissions Ended: February 20, 2012. E.P. Release Date: March 26, 2012. Competition Starts: March 26, 2012. Submissions Deadline: April 23, 2012. E.P. Release Date: May 21, 2012. Region: Africa & The Middle East. Competition Starts: May 21, 2012. Submissions Deadline: June 18, 2012. E.P. Release Date: July 16, 2012. Competition Starts: July 16, 2012. Submissions Deadline: August 13, 2012. E.P. Release Date: September 10, 2012. After all five continents/regions and their respective E.P.s have been completed and the individual E.P.s released, Black Hole Recordings will release one comprehensive and cumulative album comprising tracks from all five E.P.s onto one massive artist album, Richard Durand Vs The World, in the fall of 2012. All winning tracks previously included on each of the five E.P.s will also be included on the final Vs The World album. In 2012, you’ll believe an album can fly. For more information, contact EMILY TAN Media Relations, +1(917) 318-3758, EmilyEmilyTan(at)aol(dot)com, and visit http://www.blackholerecordings.com, http://www.richarddurand.com, and http://www.facebook.com/djricharddurand. Watch the album trailer: http://youtu.be/PCorMmJhl8k.